We are seeking enthusiastic and friendly volunteers with an interest in Colorado history and state government who enjoy working with the public. Capitol guides are responsible for leading historical tours throughout the building, including the Capitol museum and dome observation area, and providing visitors with concierge type services at satelitte visitor information desks. The Colorado State Capitol welcomes about 300,000 visitors annually, with nearly 70,000 visitors taking tours of our beautiful and historic Statehouse, including many student groups, senior groups, and professionals. 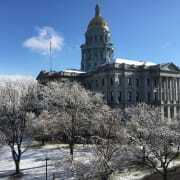 For more information about the Capitol, please visit our website at http://leg.colorado.gov/visit-learn. We are open Monday-Friday and are not able to offer weekend shifts. Contact Erika at erika.osterberg@state.co.us with questions about this volunteer opportunity. Must love working with the public and people from all walks of life, including children. Note that Capitol tours involve walking throughout the building, including up and down the stairs.